Are you seeking a coloring map of the 5 oceans that is printable? We are glad you found us! You will find what you are looking for below. 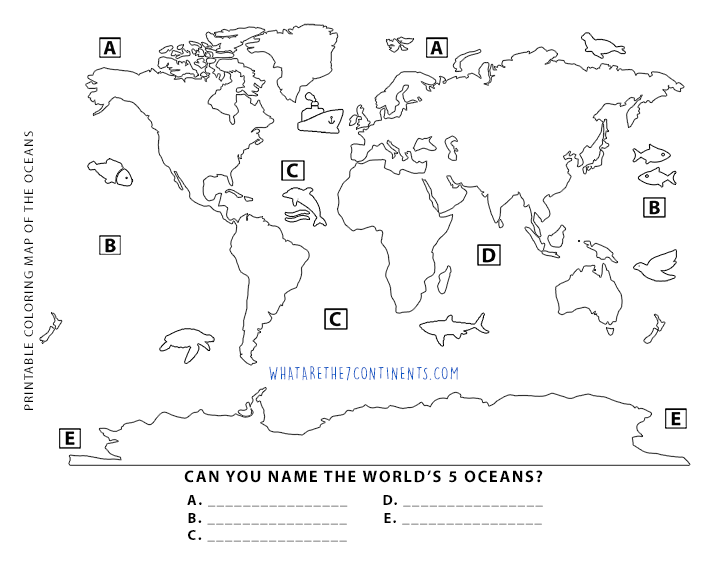 We have designed a custom map that has both a simple quiz about the 5 oceans and a nice colorable design. For children, maps like these that allow them to both learn and be creative is a great way for them to learn about their world. This oceans map is designed to let children enjoy the learning process. It is becoming more common for young people not to have knowledge of the world or where they are in it. Learning geography and information about the oceans makes travel interesting and global news more relevant as they grow. We designed this map to make it fun to learn about the oceans and to help them naturally be interested in learning about the world. This oceans coloring map is purpose-built to be used at school and at home. This map can be printed so that children can explore the different oceans, label them, apply color to it, or even cut out the different pieces to arrange them as a puzzle. This map can be used to map historical journeys, find their location, see where family members live, or use it for a project at school. Since learning is never complete, we encourage you to share with us how you used our resources so we can share it with the next visitors who find this page helpful. With resources available to both home-schooled teachers and conventional teachers alike, the search for free learning tools is a constant struggle. Use this free printable map with our compliments to teach children about the world they live in and encourage their creativity in a fun environment. Simply click the link under the map image below and download/print this 5 oceans coloring map as much as needed without any cost to you. This map includes the Pacific, Atlantic, Indian, Arctic, Southern oceans along with all seven continents.